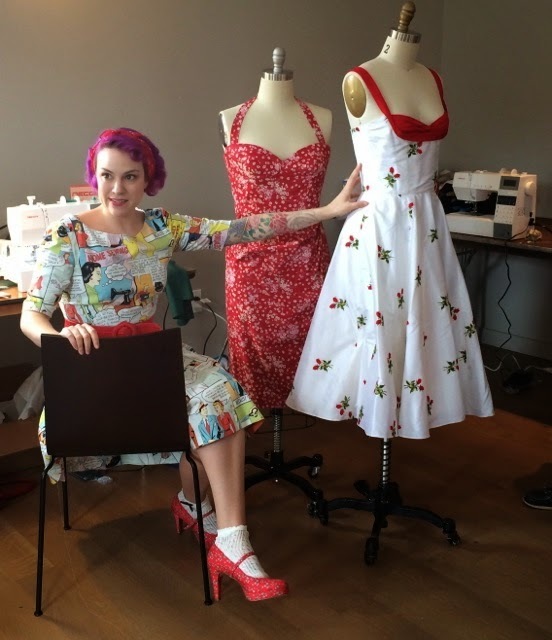 Gertie's New Blog for Better Sewing: My Inaugural Beacon Sewing Retreat! 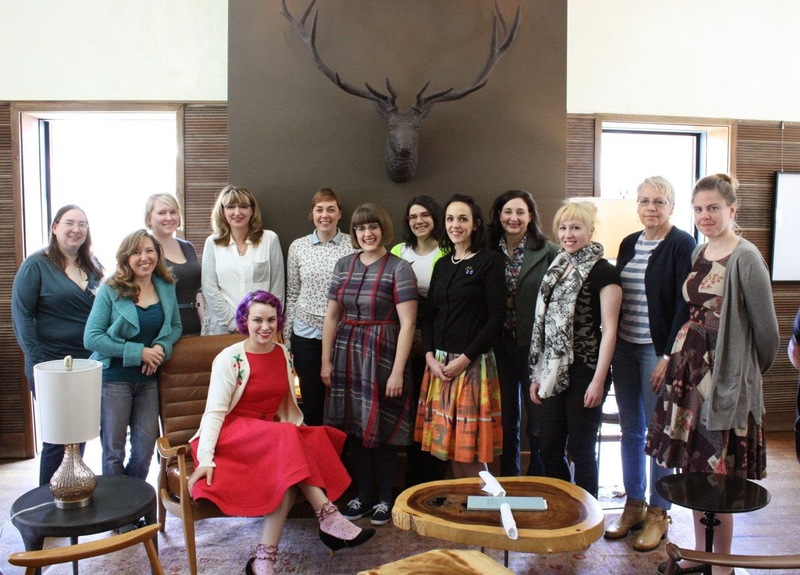 My Inaugural Beacon Sewing Retreat! What a weekend! After months of planning, my first sewing retreat was a complete success. 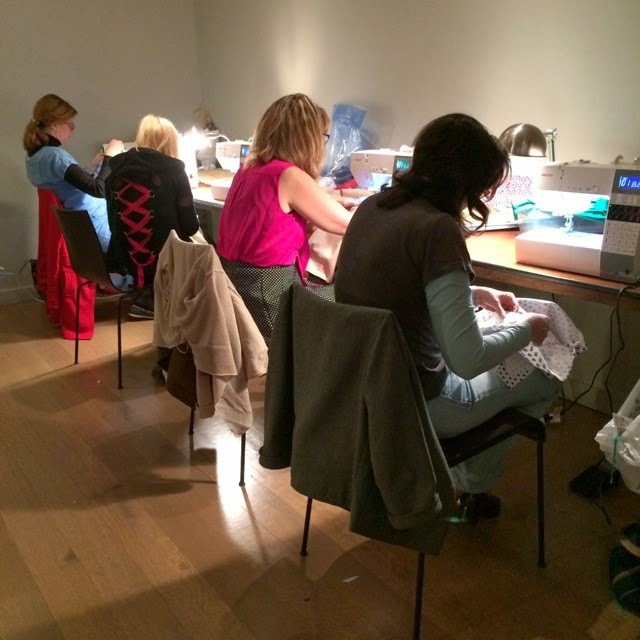 11 ladies came together in my town of Beacon, New York for a few days of sewing fun. It took place at a boutique hotel called the Roundhouse, in a private event room overlooking a waterfall. Scenic! My trusty friend and righthand woman Fleur helped me out. I brought a bunch of garments to show and tell with. Necchi generously provided machines. We used the Ex60, which I highly recommend. Now I really want a machine with a thread trimmer! Friday night we started things off with a cocktail party. I love an excuse to dress up. Here I am in my Butterick pattern, B5882. The ladies started arriving! Everyone hit it off from the get-go. 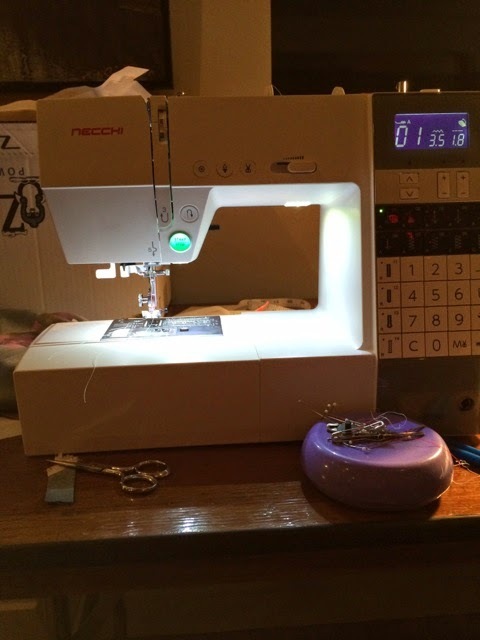 After a lovely dinner, Bunny from S&S Vac, Appliance, and Sewing in Poughkeepsie showed us how to use the machines. The next day we started bright and early! I wore my "Home Sewing Is Easy" dress since it seemed like the perfect occasion. I'm posing here with the sample version of B5882, which I brought for the ladies to inspect. We started off the day by diving into FBAs. Here I am with Marie, Alison, and Joanna. Here's Jenny of Cashmerette, in a muslin version of B5814, looking VERY Joan Holloway! 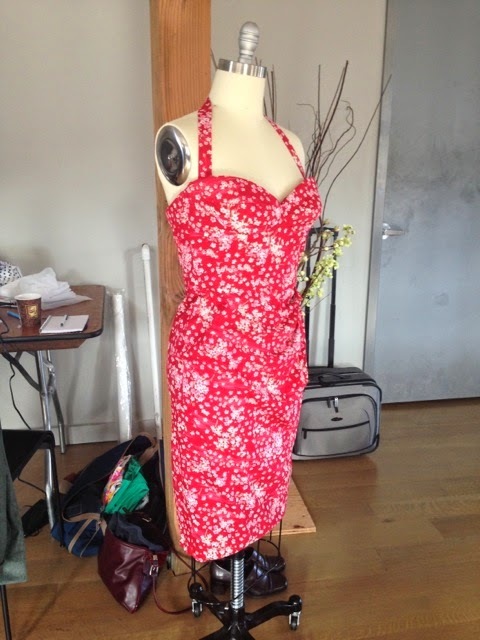 I did lots of demos: how to sew underarm gussets, how to use boning, lapped zippers, bound buttonholes, and more. 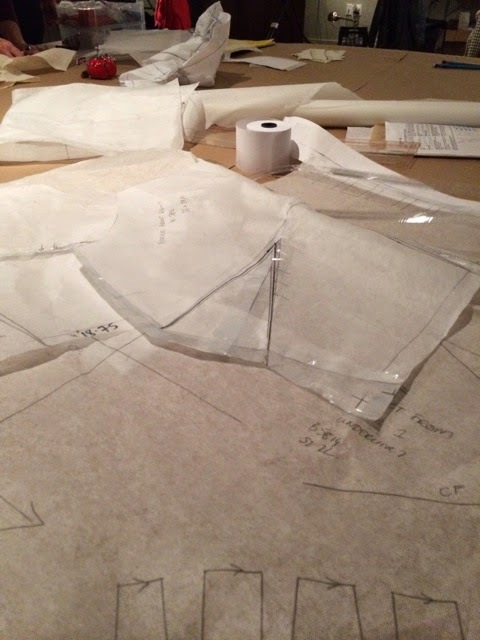 We did muslin fittings and adjusted patterns. 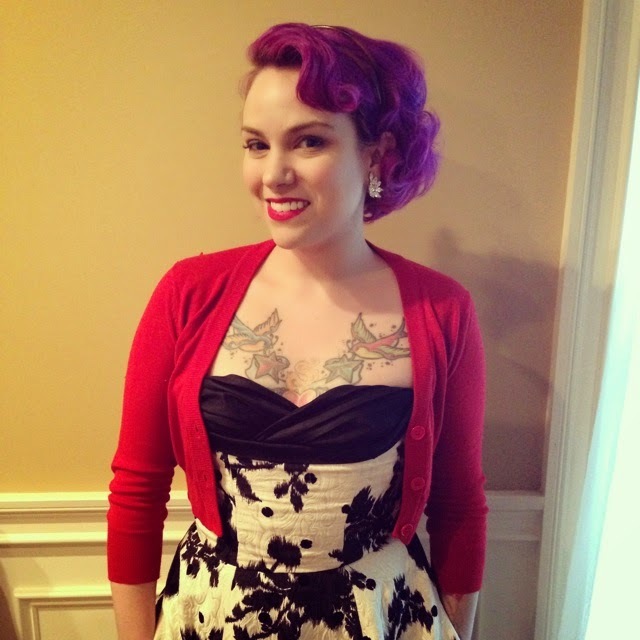 A few people were working on the bombshell dress! Here's my version on display. And here's Lauren, after we fit her version! After fitting, she cut out a bustier version in an eyeglass print. Yes! We sewed into the wee hours. Kim made my pant pattern B5895 in adorable polka dots. Emily, Kristen, Jacky, and Kim hard at work! We did some more sewing Sunday morning and finished with a farewell luncheon. Here I am showing the ladies a sneak peek of my next Butterick pattern! We finished by taking an official retreat portrait. Left to right: Marie, Blanca, Jenny, Jacky, Fleur, Lauren, Alison, Joanna, Kim, Kristen, Annelieke, and Emily! I want to thank everyone who came and made the weekend so wonderful. And let's not forget Mr. Gertie, my staff event planner! We're already thinking of having another retreat in the fall. If you'd like to join the mailing list, just fill out this form. Hurray! It was SUCH fun. Thanks so much to Gertie, Fleur, Jeff, and everyone who helped behind the scenes! Hear hear, Jenny! It was such a wonderful weekend! 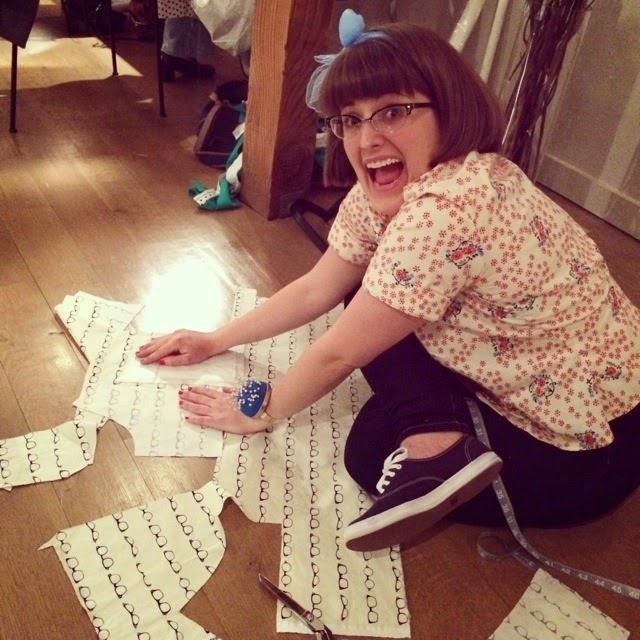 That pretzel pic of me cutting out fabric makes me giggle! Thanks, Gretchen, Fleur, and Jeff! I was wondering, as I won the vintage make-up book giveaway recently, should I have been contacted by HRST Books yet? I understand if they are busy, but I just wondered whether I had missed email or something! A fabulous weekend!! An experience to last a lifetime. Thank you so much for putting this together for us. It was such a wonderful opportunity to meet you and to see your dresses and designs in person...oh my! It really is a different experience seeing all the level of details you put into your construction. You are a true master:) Thank you from the bottom of my heart! Fleur was an excellent teacher. I have no idea how I would have gotten through the lapel line without you and Fleur, I could not visualize it. Thank you! What a fun way to spend the weekend! It looks like such a fun time. Bravo! You brought back memories for me. My mother had a Necchi, she taught me how to sew on it. It was all metal...Green! I don't think it zigzaged, just forward and backward. Wonderful workhorse. I'm really glad you all had a great time! Vintage Necchis are supposed to be the best! 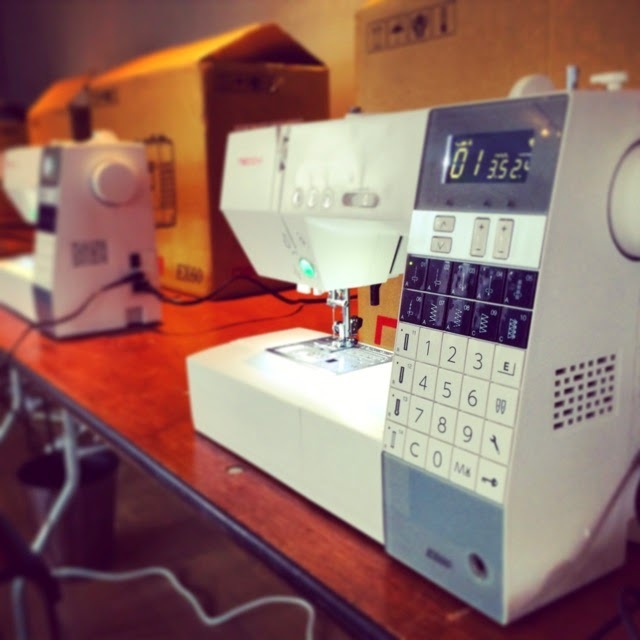 Janome bought the brand 2 years ago and they're trying to rebuild it with these new models. I think they're very good! You look like you had so much fun! Aww I wished I lived in the states, I would love to come. Hmm I wonder if my boyfriend will mind if I use our summer holiday money to join in your next retreat?! What a lovely way to spend a weekend! I really wanted to go this year, but I'll settle for next year. Will you be having another one? I do hope "sew" wink wink! I'm already starting a Gertie fund! Yep, make sure to join the mailing list at the bottom of the post! I'm hoping to do the retreats twice yearly. Get that Gertie fund going! 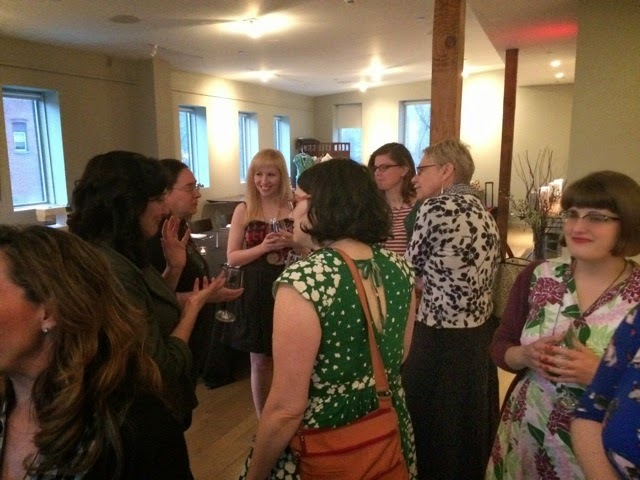 Hey ladies & Gertie, That weekend was so much fun, and everyone was so lovely and friendly, I had a blast! I will admit that I think i'm only just physically recovering from it today, along with severe cupcake withdrawal symptoms. You can't go off cupcakes cold turkey like that! P.S. You are the best. Sigh. A whole ocean and then a continent separates me from your sewing retreat. I might have to plan something for 2016 (milestone birthday year.....). So pleased it was a success for you. I just watched some of the Great British Sewing Bee season 2 and I think the winning coat was your Butterick pattern! Did you see it? I love that hair color, especially with the red accessories! I wish I had been able to be there -- last year in Pacific Grove was so much fun! 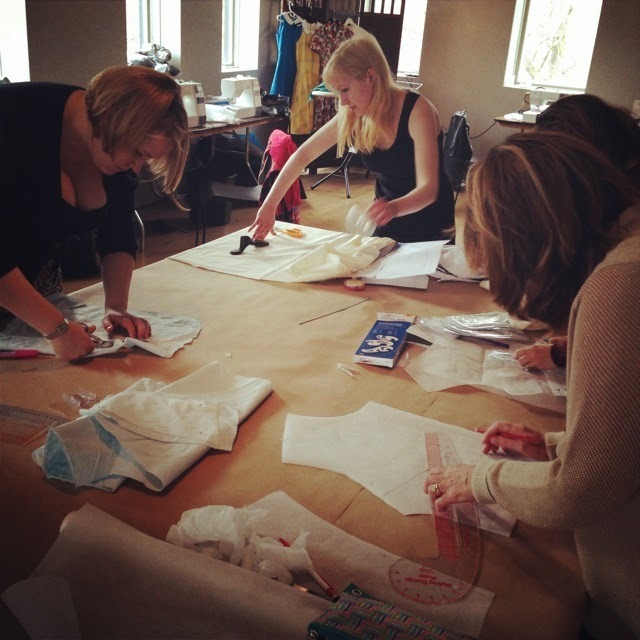 I would love to bring you to Sweden for a sewing retreat. I had a small sewcation with a friend of mine. We sewed for 5 days around the clock. I also have to say that your shirtwaist dress is my all time favorite pattern. I've made a multiple of differens ones. Tie collar, sailor collar, ordinary collar, bigger collar, blouse. I love it. You can see them in my gallery. I can't wait for your next book. You are amazing! This looks amazing! You all look as though you had a ball. Can't wait to start the sew along for the slip. Gertie, I love your hairstyle, it suits you so well. 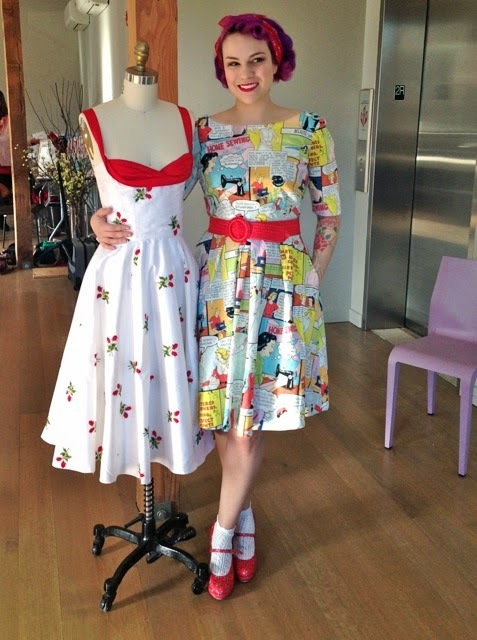 And I reeeaaallly love the "Home Sewing is Easy" dress, and the way you styled it. 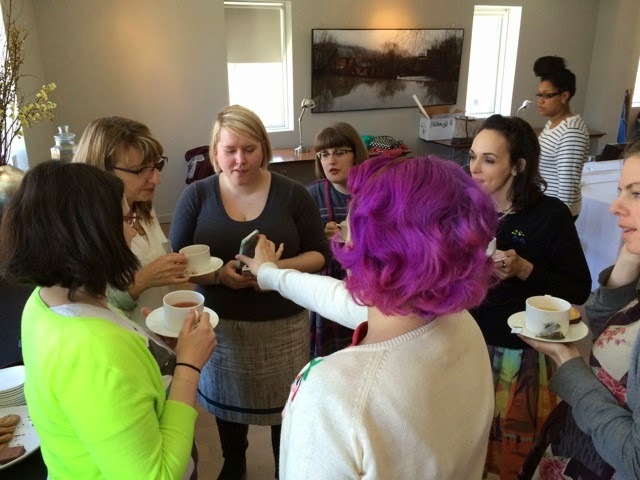 I recognize one of the participants, but don't remember her name or the name of her blog. (brunette pageboy, glasses, wearing plaid dress in center of first pic). 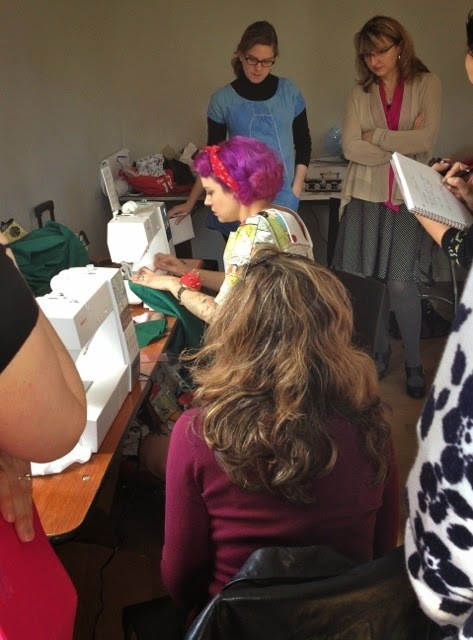 I wish I could have been there -- what a dream to spend time with people with an interest in sewing. Congratulations on your success! Gertie, I enjoyed each and every minute of the retreat! I returned home exhausted and in sugar withdrawal, and if that's not an indication of a good time, I don't know what is. Yesterday, I started drafting a skirt pattern (I've never drafted a skirt pattern on my own before) based on one of Jenny's skirts, using my leftover polka dot fabric. I was inspired and this weekend I saw that pattern alteration is not a mysterious and undecipherable process. Many thanks! This looks like so much fun! I would just love to spend time with people who share the love of sewing. I'll be watching for the next one! 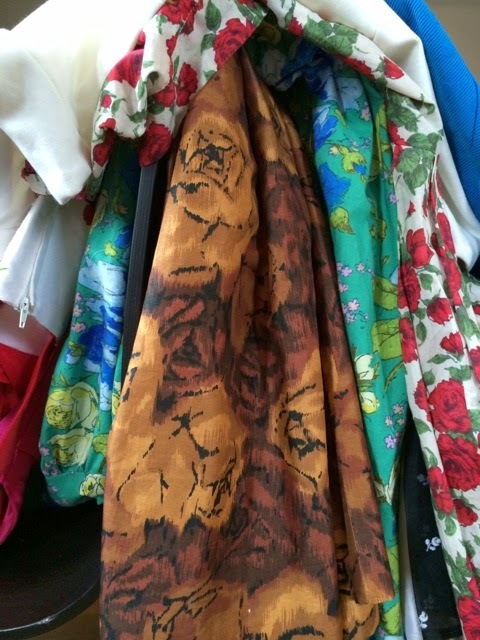 My mother, grandmother, aunts, and assorted family friends have a sewing retreat every fall. I look forward to it already even though its just barely spring! They are all quilters and I am the only garment maker, but they've all made their fair share of clothes and are so very helpful when I am puzzling something out. That group, collective, collaborate creative experience is really something special. I am glad to hear you all had such a delightful and productive time! Gertie, Thanks for sharing your weekend on your blog. It looks like it was a blast. Maybe the next retreat will work for me. 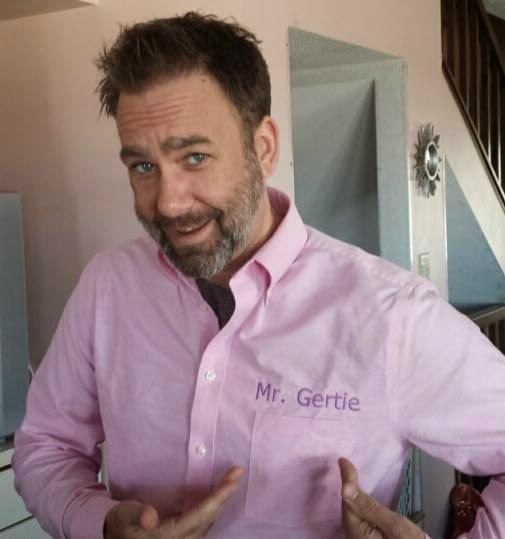 And I have to say I LOVE Mr. Gertie's personalized pink shirt. :) Cheers!! So lovely! I really wish I could have come, but I will have my sights set on fall! Thank you, Gertie, so much for this retreat. It was a wonderful platform and learning experience. It was really great to also see techniques and tips executed, as well as have the opportunity to see some of your previously constructed garments first hand. Wow! In addition, the preview of your upcoming book was amazing and I know it will be a hit! I can't wait to get a copy once its finally published! September can't come fast enough! The other great thing about this retreat was your "supporting staff".. aka: Jeff / "Mr. Gertie" and Fleur. They should get an Oscar for being the best! I give them two thumbs up and a 5 star review! LOL ;-D. And, Allison really provided me with good direction and advice with respect to my sewing business. Thank you for inviting her and tell her that I wish her all the best with the grand opening of her Alterations Shop. I also got to meet some wonderful retreat attendees -- all are very smart and successful women from different walks of life, who all love sewing as much as I do. Hudson Valley is very quaint and I fell in love with it. Such a lovely place, great people, and wonderful retreat. Looks like you gals had a lot of fun! I wish I could have been there!! Odd that the machine looks EXACTLY the same as the new Janome DC7060 - are they really the same machine but in disguise? Janome purchased the rights to the Necchi brand approximately 2 yrs ago. They wanted to provide sewers with three different lines of sewing machines. They offer Janome, Elna, and now Necchi. That looks like so much fun! 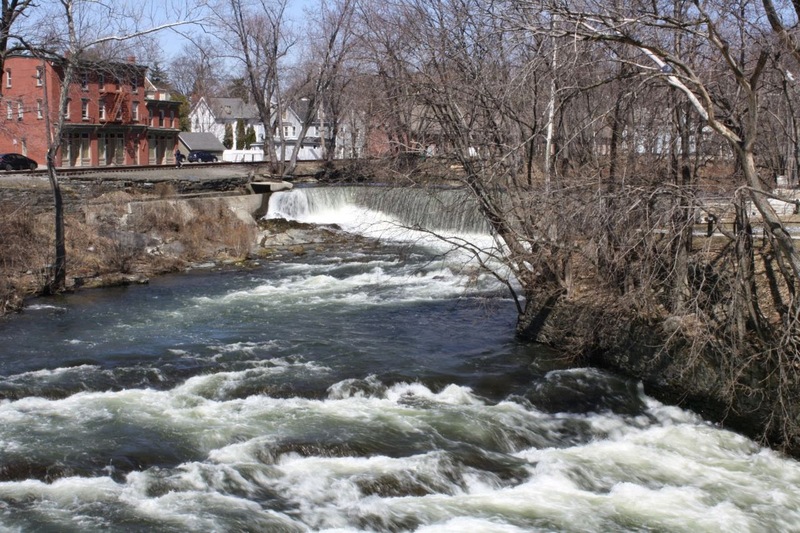 I had no idea that it was so close to me (upstate New York)! I'd definitely be interested in one in the fall. I tried to sign up for the list, but the "subscribe" button didn't seem to be working for me. This was on a Mac, using firefox. The next time you find this happens to you whether you are on the Gertie page or any other website, Simply try downloading an updated version of firefox. If that doesn't solve the issue, then download the Google Chrome browser or Safari browser. They are free and can work as a second option for you. If yoy find that your updated firefox still doesn't work for you, then download one of the other browsers I mentioned. Once you download the browser, you may be required to reboot your computer. After you are done you will notice an icon for the new browser on your desktop. You do not have to make this new browser your default browser if you don't want to, but it will help you if you're ever in a bind like that again. You will double-click on the new browser's icon and you will be prompted to enter the link or information you wish to search. You can access the page and at this point that subscribe button should work. The issue today is there so much technology is evolving so quickly (as well as a variety of different browsers with numerous versions and updates) that sometimes different programming languages, which are used to create these interactive GUI interfaced pages, have not caught up to all the browser changes that have occurred and need to be tweaked. It's a simple fix, but if you ever have that obstacle again it's good to know this...Especially if you ever have a small window of time to submit something and you don't want to miss out. This was one of those events that you KNEW would be fun, worthwhile, and a heapa buncha other wonderful adjectives even before it started. Kudos to you and the Mister for doing it. Me too about the subscribing. Thanks for the reminder that the link doesn't work, Ms. Dunn. Yes, please add me: lovinlocks@cheerful.com. Oh it looks like SO MUCH fun!! Well done you for organising such a fab thing. One day we have to get you over to this side of the Atlantic! Oh wow! This looks like a blast! I recently discovered your blog and I am hooked. I hope I get to attend of your events someday. Thanks for sharing.